1) I really think Zach Braddock belongs on this list. I know it's possible he'll be a starter again someday, but I don't see it as likely. He's never pitched more than 71.1 innings as a pro, and he's close to big league ready. Given his injury history and low inning totals, it'd be nearly impossible to stretch him into a major league starter. 2) I think Fiers is interesting too, but by mentioning him as a 2009 draftee but not mentioning his age, you make him sound like he's pretty young. He'll turn 25 during the season. Realistically, if he's a prospect at that age he should dominate the low levels of the minors and advance quickly. 2010 will tell the real story on him, if he's given an opportunity to compete at the upper levels. 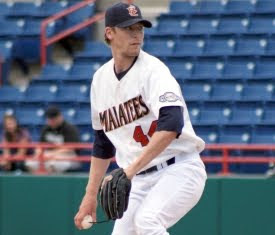 3) Wooten is a perfect example of why an AFL ERA doesn't mean much for a pitcher. Wooten had eight AFL games, and had five consecutive scoreless outings (6.2 innings) at one point. He had four hitless outings in eight tries. But because he got roughed up in two outings, his ERA got inflated. I agree on all accounts, and Braddock is the main reason I'm doing a third category of pitchers. It would be a surprise to see him start again, but as long as the club holds out even a shred of hope that he starts I'll put him in the middle group. Good point on Fiers, he's clearly an advanced pitcher and the age likely played a big part in the clubs willingness to move him as far as he did. Those strikeout:walk numbers were hard to look past. Of all the five names on the list, I agree, the Fond du Lac residence, LHP Casey Baron, is interesting. Huntsville Stars Buck Rogers says this crafty lefty carried the club out off the bull pen in 2009. Baron's sring-summer numbers earned him a spot on the 2009 Southern League All Star Game. Stars pitching coach, JC, says that lefty should be assigned out of Spring Training to Nashville and will get the lefties out. Also going around is the new Brewer pitching coach is traveling to Milwaukee and will see the arsenal! This will be interesting to watch!